Since many aspirants will be facing interviews of UPSC / GPSC and other state PCS exams in February-March, therefore I’ve quickly assembled a summary of budget and economic survey for their reference, before I begin my lecture series in a systematic manner. Economic Survey volume1 (entirely-but I’ve written only interview-related important points here). In this summary, I’ve not written full forms or given background theory-connectives, because the target audience is Interview candidates. They should be well aware of that…. if not, then watch my BES17 Lecture series again. इस बार कुछ खास नया माल नही है. 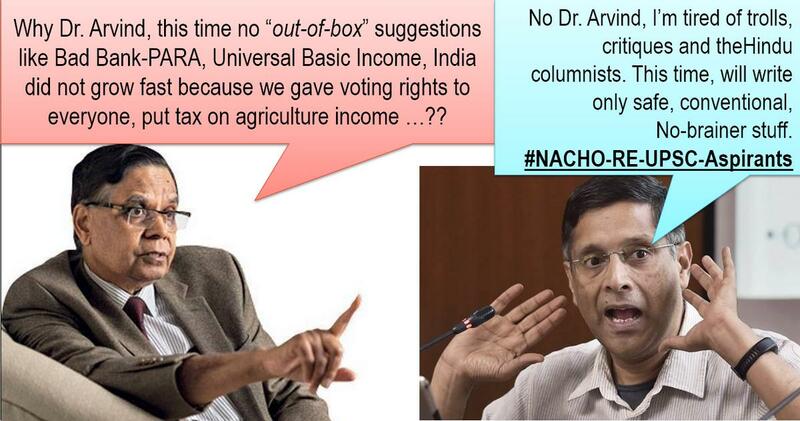 CEA Arvind Subramanian is neither repeating many old things, nor proposing new things. 80k crores on PSB recapitalization. Strong RRB can raise $ from market, RBI to handover NHB to Government. RBI, SEBI to encourage corporate bond market. ~25% of Corporate borrowing from there. Unique IDs to enterprises for tracking loans, schemes and Ease of Doing Biz. Post office, NSC, PPF acts to be more people friendly. SEBI, Securities Act to have more teeth. Blockchain tech. to promote digital economy, but Bitcoin & Cryptocurrencies declared “not-legal tenders”. Government to take action against their use in illegal activities. Three Public sector Insurance Cos: National Insurance Company Ltd., United India Assurance Company Ltd and Oriental India Insurance Co. Ltd will be merged into a single insurance entity, and later its shares will be listed. Financial inclusion: Already 60 cr. Jan-Dhan accounts. More efforts to link them with PM Jivan Jyoti, Surakasha Bima, Fasal Bima. + new Health insurance scheme of Rs.5 lakh per BPL/rural family per year. New policy / reforms for: MSME-NPA, MUDRA refinancing via NBFCs, Angel Funds / VCF. For Mobilizing saving (into financial instruments): we’ve done: demonetization, drive against black money. For mobilizing Investment: we’ve done FDI, Ease of Doing Biz, Bank recapitalization, I&B Code. But we must focus more on attracting investment, for 8-10% GDP growth rate. Twin Balance sheet Syndrome (TBS), Infosys-TATA board battles. Greater demand for state intervention. TBS: Banks reluctant to lend. Many PSBs making losses in past 3 years. Recapitalization increases fiscal deficit. I&B work in progress, FRDI bill proposed. Indirect Taxes: CGST > Union Excise > Customs > GST compensation Cess > IGST. Salaries: President (5L) > Vice President (4L) > Governors (3.5L); MP salaries revised with inflation every 5 year. Disinvestment Targets: 80k Crore (Last Year 72,500 cr). New ETFs, incl. Debt-ETFs planned. Air India to be privatized. Tax buoyancy has improved. 90k cr more collected compared to the scenario two years ago. No. of Tax-filers increased, though “compliance” behavior is not appreciative. Non salaried professionals hardly paying IT in ~7k to 35k range. Income tax Slabs: Not changed (5-10-20-30%). (New) 40k Std. deduction. But transport & Medical exemptions removed. Elderly: No IT or TDS on interest income upto Rs.50k (earlier 10k), Upto 50k deduction for health insurance premium, upto Rs.1 lakh for critical illness. Pradhan Mantri Vaya Vandana Yojana (LIC): 8% return for upto Rs.15 lakh till March 2020. Cess on Income Tax & Corporation Tax Cess: 2% Primary Education + 1% Secondary & Higher education + (new) 1% Health cess to finance the new health insurance scheme for BPL/Rural. Securities: 15% short term CGT + (new) 10% Long term CGT, if profit more than 1 lakh. Equity Mutual Funds: 10% distribution tax. Gift City (IFSC): certain securities removed from Capital Gains Tax (CGT), There will be Alternate Minimum Tax (AMT) instead of MAT. New regulator for Gift city. Black Money: Trusts can’t pay more than 10k in cash. Stricter rules for TDS compliance. Every entity doing transactions of Rs.2.5lakh or more must get PAN, incl. its office bearers. Farmers FPO: 100% deduction for next 5 years. This will help in Op. Greens and Pradhan Mantri Kisan SAMPADA Yojana (Scheme for Agro-Marine Processing). To reduce Tax terrorism: E-assessment for direct taxes. Customs Act’62 amendments for implement WTO’s Trade Facilitation Agreement (TFA). Customs to have authority for advance ruling. GST: Yet to be stabilized. But, data also helps in finding more about informal vs formal sector of economy and employment level. CEA repeating things from last 2 years i.e. poor services -> citizens “exit” or become “free rider” -> Government’s accountability decline. Compared to Brazil and Germany, our State governments and Rural local bodies not collecting adequate taxes on their own. So, they rely more on FC devolution. Aid curse and resource curse, due to lack of accountability. Budget: Gold monetization scheme and Outward FDI to be reformed. GIFT city IFSC to have separate regulator. Political unrest in Middle East (Iran domestic, GCC boycotting Qatar), Chinese slowdown, OPEC-Russia oil cuts. Advanced Economies recovering and coming out of zero interest rate regimes- consequently flight of capital could happen. Farm loan target: 11 lakhs (Last year 10 lakhs). Lessee cultivators will be covered. 2x farm income by 2022 ke liye 1.5 x MSP. FCI’s working capital to be raised via debt & equity for this. GrAM gramin haats. Because small-marginal farmers can’t bring their produce to APMC / E-NAM. These GrAM haats will be connect via PM Gram Sadak Yojana. Organic farming ke liye Women SHG. Fishermen and Animal Husbandry-walla to get Kisan Credit card and new funds. Farmers to sell surplus electricity from solar panels in their farms to DISCOMMs. RURAL Infra ke liye: SBM ,Ujjawala, Saubhagya electricity, PM Awas Yojana, PM Krishi Sinchai yojana, NRLM … all these schemes’ funds and targets increased. Total rural infra Expenditure: 14 lakh crores. ES18v1c6: For both for economic and social development, people need to be moved out of farms and villages. (Sir Arthur Lewis and Dr. Ambedkar). Extreme weather events affect agro. climate impact is twice on unirrigated farms than irrigated. With higher temperature and shorter rainfall: income fall- 15-18% (irrigated), 20-25% (unirrigated). Just like GST, we need cooperative federalism against Agricultural distress. EPF rules tweaked to create new jobs, provide relief to women workers. PM Kaushal Kendra in every district. Package for textile sector. 2017-18: 6.75% growth rate. Per capita income: 1,11,782 Rupees (Current price) | 86,660/- @constant price (2011). IIP improved. Moderate level of inflation, CAD, FD. IMF: Post-GFC recovery is occurring in major economies. Indian economy is now 2.5 trillion dollar economy – seventh largest in the world. World Bank Ease of Doing Biz 2018: 130->100th rank. Forex reserve at $409 cr. Pre-GFC boom catalysts were 1) private investment 2) exports, but both are not upto picking up at present. Post-demonetization: less cash economy, growth is recovered but not to full potential. Global hunger report: India very poor performer. RESIDEX: house-prices inflation in majority of the cities, even Post-Demonetization. OPEC-Russia Oil cut deal: 12% hike in oil prices expected in 2018. If hike is passed on, there will be inflation. RBI’s 2-4% CPI target already breached on Dec’17 (5.2%). Fiscal Deficit to aggravate when there are excise-cuts to absorb oil price hike before election. CAD also increasing due to oil prices. New: Sela Pass tunnel for Arunanchal Pradesh. Rest is just mention of Existing initiatives like PRAGATI portal for monitoring infra progress, BHARATMALA, Smart City, AMRUT, HRIDAY. Railway: Focus safety, unmanned crossing, CCTV, wifi; broad gauge conversion, Mumbai & Bengaluru local train network to be strengthened. A’bad Bullet traine ke liye Vadodary academy. Rail University at Vadodara. Aviation: (existing) UDAN for cheap regional flights. Now, NABH Nirman: five times more airports will be built to handle billion trips a year. Digital Infrastructure: 5G test Bed @IIT,Chennai. NITI program for AI, DoT mission for Cyber physical systems; Digital India: 2x funds, broadband and wifi for rural Indians under BHARATNET. GOBAR-DHAN: Galvanizing Organic Bio-Agro Resources Dhan for management and conversion of cattle dung and solid waste in farms to compost, fertilizer, bio-gas and bio-CNG. Burning Crop residue = Delhi pollution. So, funds & Subsidy for neighboring states’ farmers. DIKSHA portal to upgrade teachers’ skill. Because we’ve enrolled kids under RTE but their learning outcomes have not improved (ASER). More Ekalavya Residential schools for ST kids. PM Research Fellow Scheme for B.Tech so they do PHD and teach on weekly basis. ES18v1C8: talks about Importance of Science Tech in national development. India’s achievement so far. But we are underspending on R&D. Brain-drain, Patent delays, Basic research neglected. Problems remedies given in the chapter, self study it for GSM3 & Essay. ‘‘Ayushman Bharat”: For improving primary, secondary and tertiary care system. Both prevention and health promotion. National Health Protection Scheme: Rs.5 lakh cover per poor family per year for secondary and tertiary care hospitalization. (This will be world’s largest scheme). ES18v1c7: Per capita income or development levels wise NE < Punjab & Haryana, yet NE better on Gender indices. So, development is not an ‘antidote’ to gender inequality. If women employments increases, it’ll help family and economy. But, Women don’t have control over their body- contraception, their labour participation rate very poor. We need to create more jobs in textile, footware and those industries should shift to smaller towns. Son meta preference i.e couples will not stop breeding till a son is born = 21 Million “unwanted girls”- They’re neglected in food & education. Notable steps by the Modi-government: Sukanya Samriddhi FD, BBBP but Survey not measured its success. PM Ujjwala Yojana gives LPG connection to BPL. Target increased. Saubhagya Yojna for electricity connections to poor. Passport @doorstep, interviews removed from group C/D. Jan Aushadhi centres for cheap generic medicines, stent price curtailed….ye sab Ease of Living hai. 150th birth anniversary of Gandhi in 2019 so Rs.150 cr under PM chaired committee for event management in latest budget. ES18v1c1: We need to change mindset also: toilet users have to be increased, not just number of toilets. If we give free Gas and electricity connections but users don’t have money to pay bills later on? Hence, “income support / DBT” also necessary. Mfg: Make in India programme, Start-up India and Intellectual Rights Policy. Anti-dumping on Chinese gods; PM Mudra yojana for MSME. Labour: 38 Acts-> 4 codes. Infra: BHARATMALA, SAGARMALA, BHARATNET, UDAN. Rail budget merged. Electricity: Ujjawal DISCOM Assurance Yojana (UDAY), DD Gram Jyoti, Saubhagya(Pradhan Mantri Sahaj Bijli Har Ghar Yojana), was launched in September 2017 to ensure electrification of all remaining willing households in the country in rural and urban areas. Pradhan Mantri Ujjwala Yojana: LPG connection to BPL. Then Ujjawala plus+ Yojana for poor not under SECC. Girls: BBBP, Sukanya Samriddhi Yojana. Health: SBM. Intl cooperation: SDG adopted, Voluntary national review given in 2017, Intl. Solar Alliance, Paris agreement ratified. Tax reliefs for senior citizens. Infrastructure creation and cooperative federalism. For Government jobs interviews, these much information should be at your lips. For Prelims and Mains point of view, we’ll be studying these things in a detailed manner, later on. yes I’ll be doing the BES-18 “GREEN” series this time. 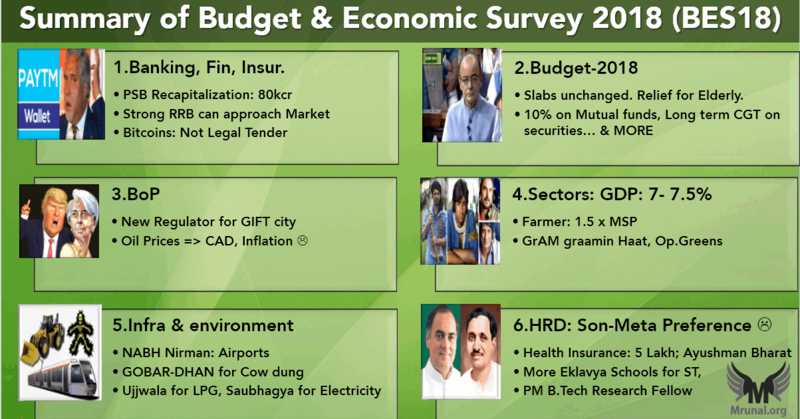 I’ve chosen green color because both in the budget and economic survey, noting much new to teach: so, it’s going to save a lot of slides, printouts & mental-effort for the aspirants. So, it’s “Eco-friendly” green BES18.. [Although I’m open to suggestions on other colors as well, Do share thoughts in the comments below!] And stay Tuned to Youtube.com/c/TheMrunalPatel…. Sir economy ki new lecture series kab laa rahe h? bes18 remaining articles? lecture series? Pls suggest me how to get economic lectures PDF…..